Massive Fossil Wood – Recently Arrived! Just arrive from Madagascar this slice of fossil wood, from the ‘Araucaria’ or Monkey puzzle tree, is truly fantastic. Cut and polished on both sides to reveal the warm reds and golds. The preservation is so good that you can almost count the growth rings. Weighing in at over 11kg and 55cm across at its widest point this is a simply massive piece of 250 million year old fossil wood from the North West coast of Madagascar. This entry was posted in Fossilised on 18 November 2018 by Simon Houghton. 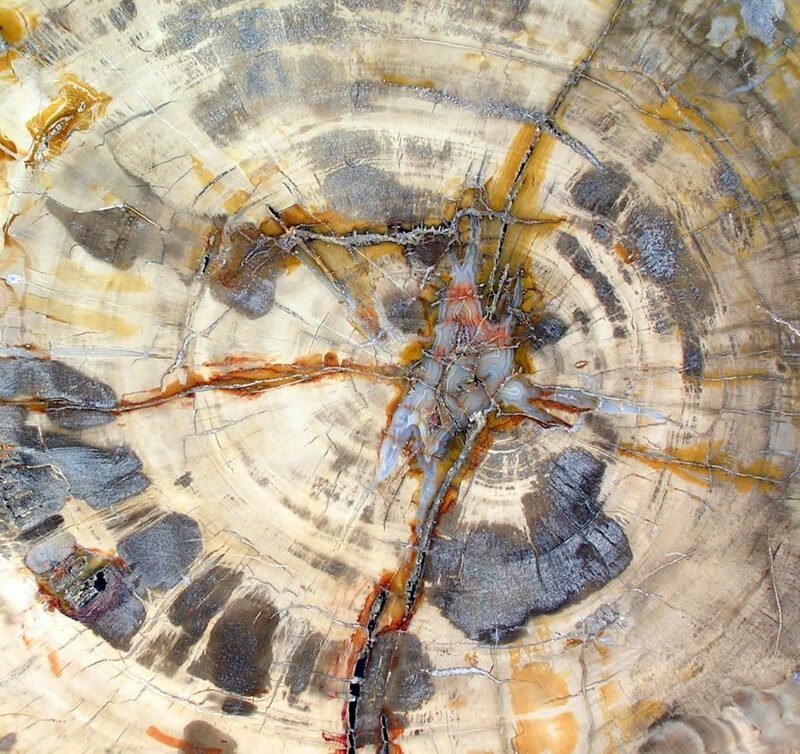 Beautiful Fossil Wood – Newly Arrived! Just arrive from Madagascar this slice of fossil wood, from the ‘Araucaria’ or Monkey puzzle tree, is truly fantastic. Cut and polished on both sides to reveal the warm creams and golds. The preservation is so good that you can almost count the growth rings. The hole in the centre has, very unusually, been replaced by a stunning banded agate. 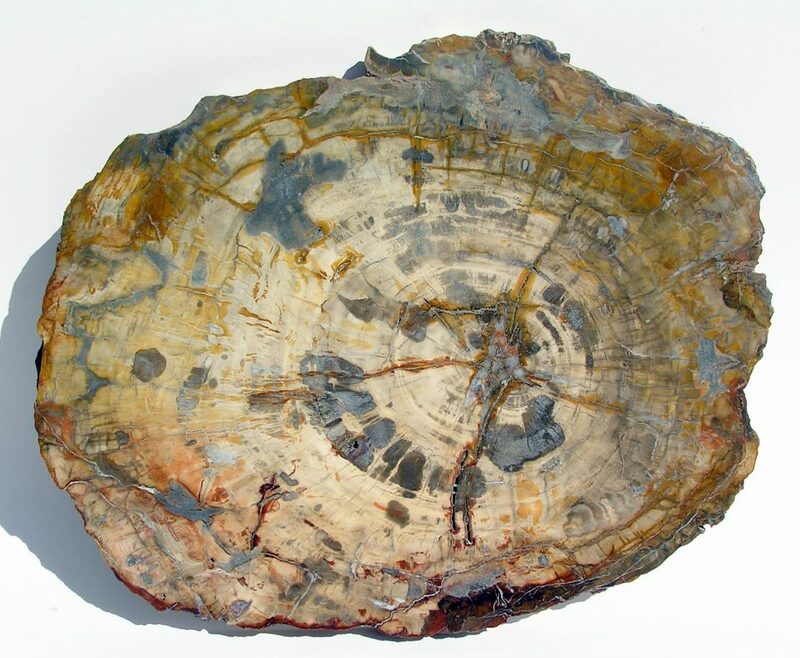 Weighing in at over 10kg and 54cm across at its widest point this is a very impressive piece of 250 million-year-old fossil wood from the North West coast of Madagascar. This entry was posted in Fossilised on 18 October 2018 by Simon Houghton. 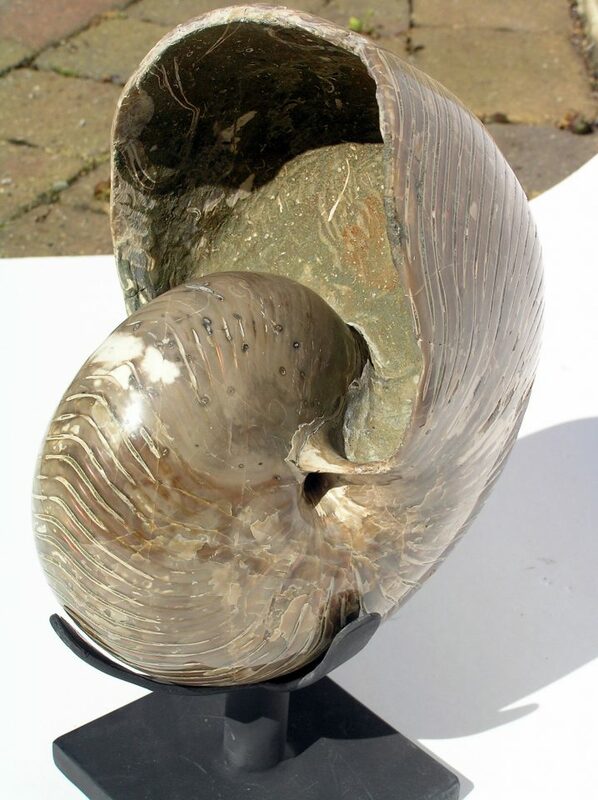 This wonderful 20cm wide Polished Nautilus has been beautifully prepared to reveal the bands of ‘Fire Opal’ in the outer shell. It has also had the sediment from its mouth removed. The fossil comes from the jungles of Mahajanga on the north-west coast of Madagascar. 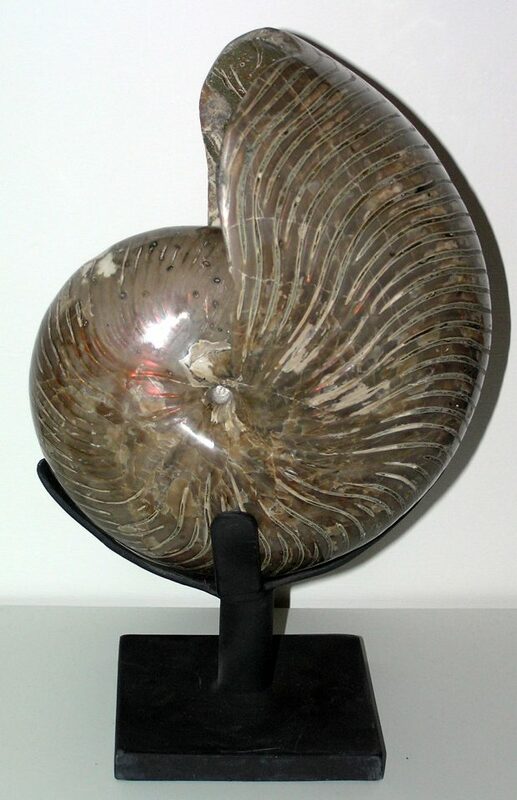 This fossil is approximately 120 million years old and from the Cretaceous period when the seas were full of Ammonites and Nautilus. This entry was posted in Fossilised on 18 September 2018 by Simon Houghton. 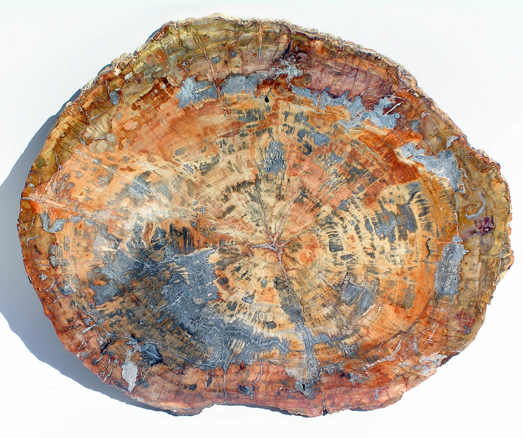 Stunning Fossil Wood – Just In! 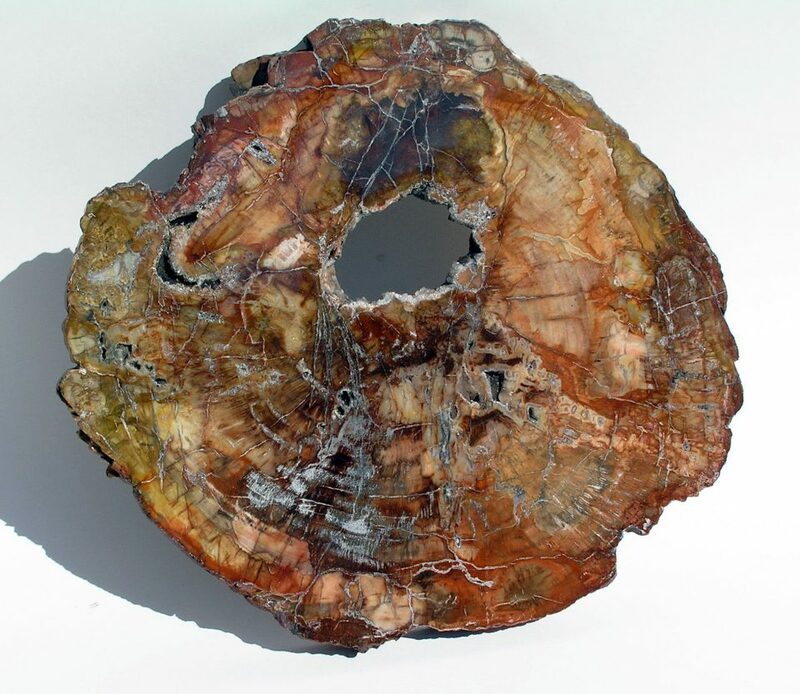 Just arrive from Madagascar this slice of fossil wood, from the ‘Araucaria’ or Monkey puzzle tree, is truly stunning. Cut and polished on both sides to reveal the warm reds and golds. The hole in the centre and other cavities are lined with gorgeous quartz crystals. 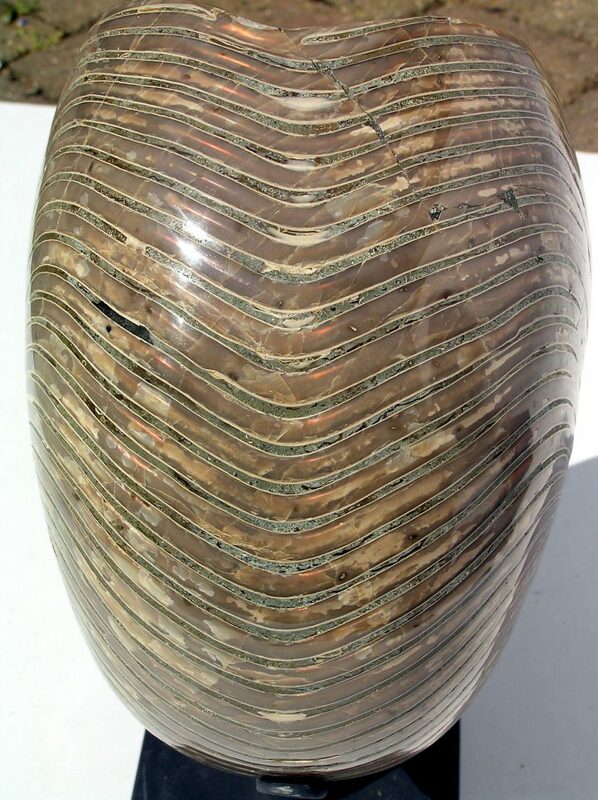 Weighing in at 6kg and 44cm across at its widest point this is a very impressive piece of 250 million-year-old fossil wood from the North West coast of Madagascar. This entry was posted in Fossilised on 18 August 2018 by Simon Houghton. 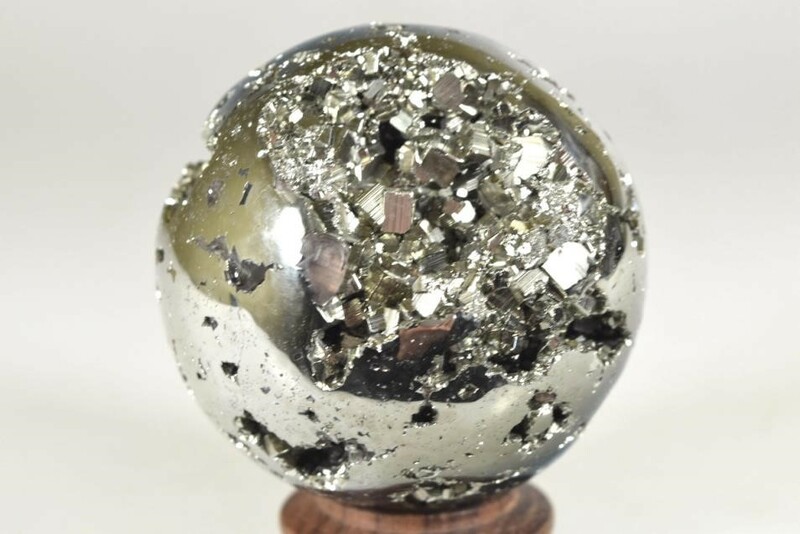 We have manage to purchase a small quantity of very high grade mirror like Iron Pyrite from the Huaron region of Peru. The exquisite crystals twinkle and glisten making it very tactile and a gorgeous addition to anyone’s collection. We have a small number of handpicked, hearts, spheres and eggs available and they will sell out very quickly. If you would like to see examples from our range contact us and we will either send pictures or bring them to a show near you. This entry was posted in Fossilised on 26 July 2018 by Simon Houghton. Just acquired from an old French Collection are a small range of these beautiful and very rare, 250 Million Year old, Triassic Fish Nodules from Madagascar. 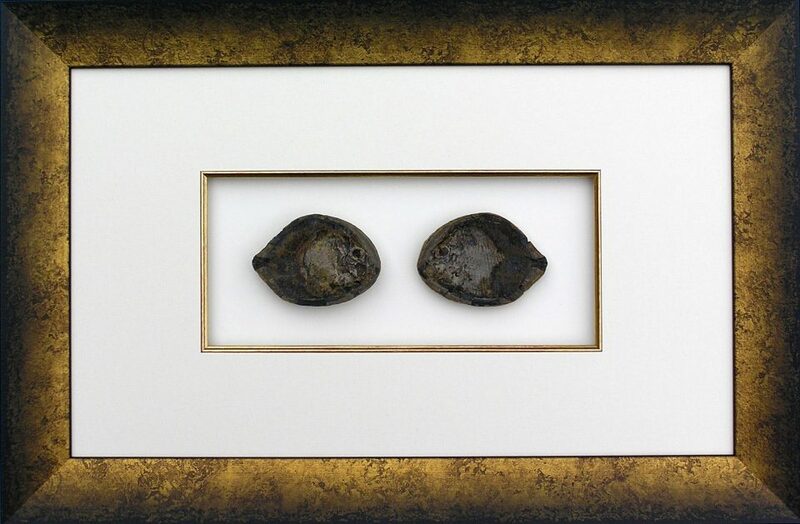 Framed either as singles or as pairs they are striking and an amazing present for the “Fisherman” in your family. This entry was posted in Fossilised on 1 July 2018 by Simon Houghton. We have just acquired a small quantity of very fine pieces of Orbicular Ocean Jasper. These pieces were mined a number of years ago but have only recently been finished in Madagascar. ?Orbicular Ocean Jasper is a rare mineral, mined in only one place in the world…?The Mine of Marovato, on the Ambolobozo Peninsula in the north west corner of Madagascar. It is called Ocean Jasper because the deposits are part of the coastline, and can only be reached by boat, and removed only during low tide. This entry was posted in Fossilised on 1 June 2018 by Simon Houghton. If you collect hearts, spheres or eggs this is a must have. If you are interested contact us as the few examples we have will disappear very quickly. Peru is an excellent source for Chrysocolla and there is a well-known mine called the Lily mine which is about 200 kilometers south of Lima. This mine produces a small quantity of beautiful quality Chrysocolla which is absolutely sky blue and stunning. 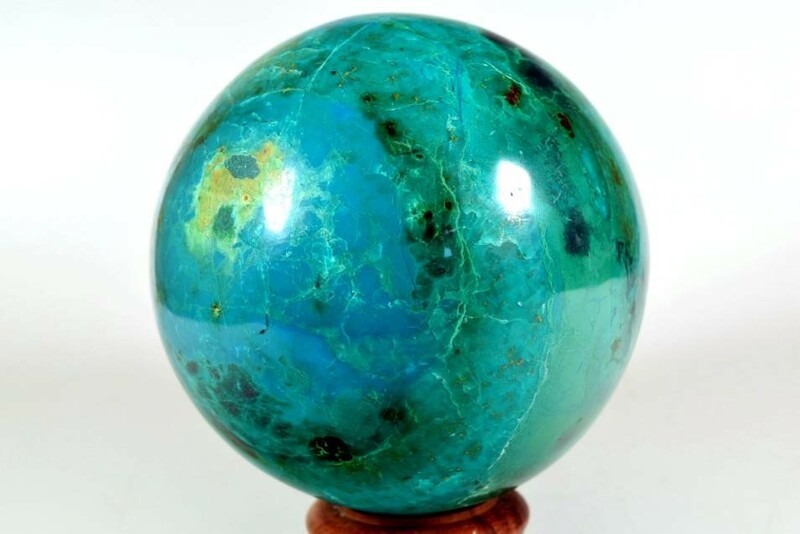 The chrysocolla we have is of a very high quality and has a wonderful polish and has not needed to be stabilized at all. It has formed with some green Malachite and some black and almost metallic Tenorite. 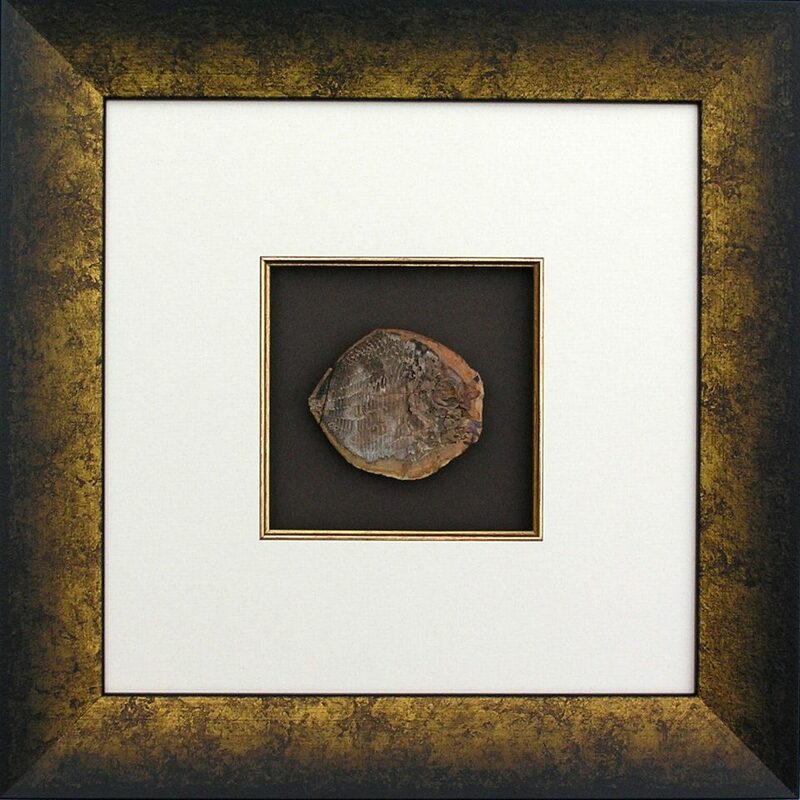 The mix of these colours makes for a very pleasing display piece of quality material. Chrysocolla is a hydrated copper and is one of the more challenging stones to polish. Top quality Chrysocolla is in very limited supply and is likely to disappear fast. 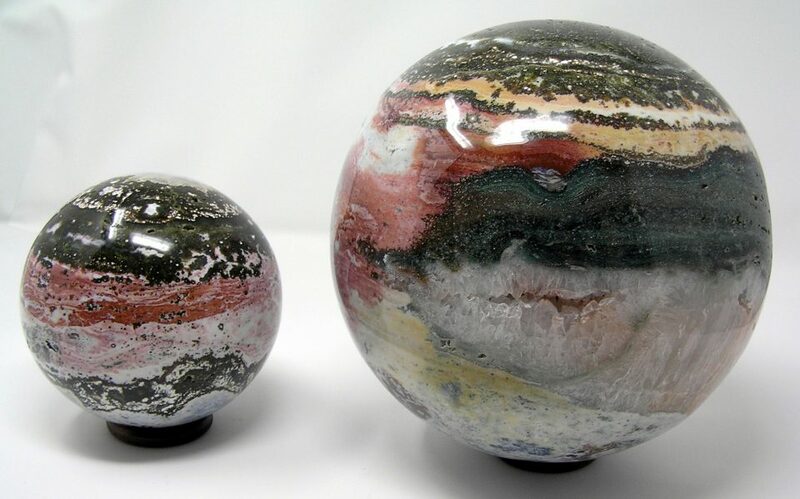 Beautifully coloured and with ‘Druzy Quartz’ chambers these examples look like planets from another solar system! 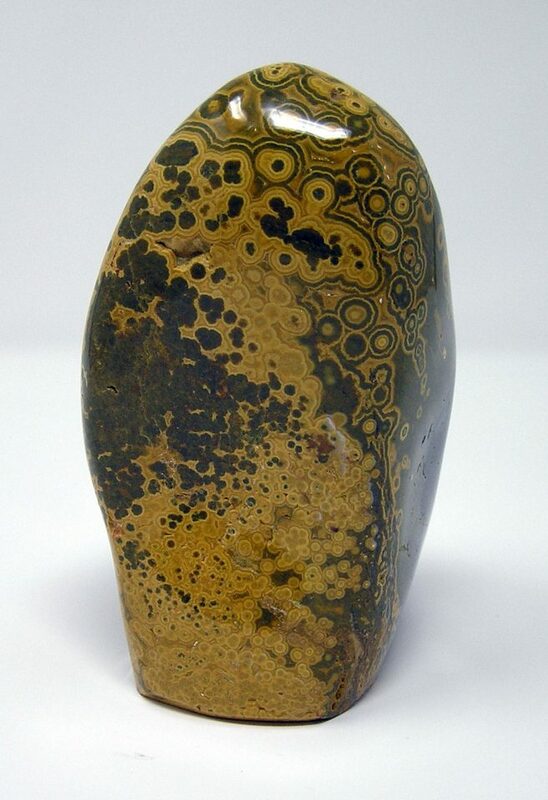 Agatised Jasper has a very similar structure to Orbicular Jasper but comes from the Northern region of Madagascar. We have a range of stunning spheres ranging from the impressive 100mm diameter ‘globe’ weighing just over 1.7kg to the massive 220mm diameter ‘giant’ weighing over 11.8kg. These spheres have to be seen to be appreciated. This entry was posted in Fossilised on 18 May 2018 by Simon Houghton. 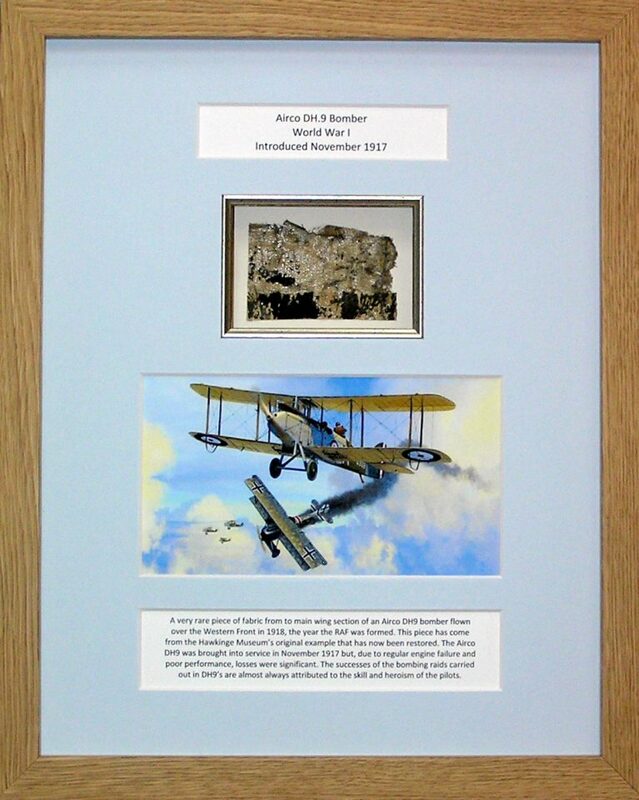 To celebrate the 100th anniversary of the formation of the RAF we have available framed relics from an original Airco DH-9 bomber. This aircraft saw action at the end of the First World War flying over the Western Front. The pieces that we have are from the main wing spar of the original that has recently been restored by Hawkinge Museum. This entry was posted in Aviation on 9 May 2018 by Simon Houghton.